We use only the finest all-natural ingredients — vine-ripe tomatoes, Pecorino Romano cheese, imported Italian olive oil, onion, garlic and our unique blend of spices — to make Mideo’s Marinara an irresistible pleasure. Crafted in small batches, this very special sauce is cooked for hours in an open kettle to release the perfect flavor. 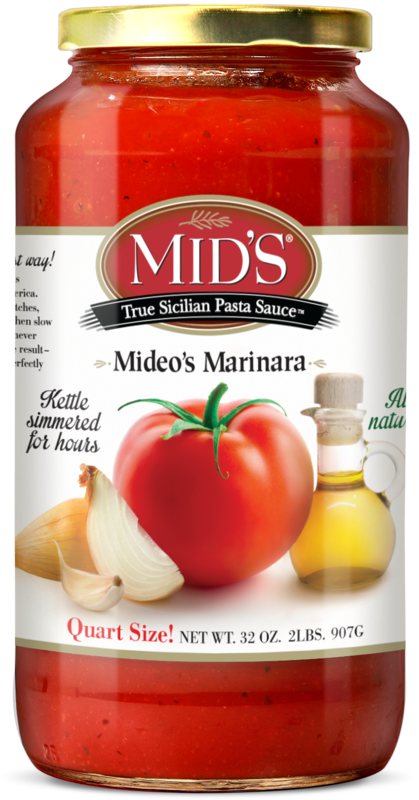 So, when you’re looking for a marinara sauce to make your next meal a real piece de resistance, no worries — MID’S has done the hard work for you. Simply open a jar of Mideo’s Marinara and the aroma will make your family come running. After all, we hand craft this marinara just the way Mideo’s grandmother did more than 75 years ago. Ingredients: Tomato Puree (Water, Tomato Paste), Diced Tomatoes, Sugar, Salt, Olive Oil, Onions, Romano Cheese (Made From 100% Pasteurized Sheep's Milk, Bacterial Culture, Salt, Rennet), Garlic, Citric Acid, Black Pepper, Spices, Paprika.